This is Part 3 of my series on how to start using herbs for your health. 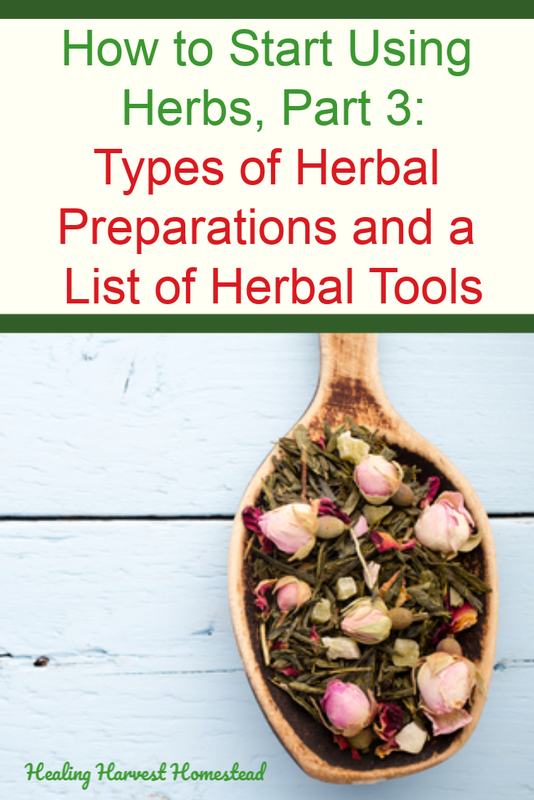 In this section, I’ll share an overview of different types of internal and external herbal preparations (forms) you can make and use for health. You’ll get to know which remedies you should use for your problem. When I first started using herbs way back in my early thirties, the only way I was familiar with using them was as a tea. In fact, I’d just go to the grocery store and buy those stale boxes of herbal teas and call it good. I had NO idea how much quality mattered, and that there were SO many other options for using herbs for health available besides tea. As I read books, experimented, and took courses, the whole world of herbal health opened up to me! I still remember how excited I was! The best thing is that now I am no longer at the mercy of the grocery stores and modern medical industry for my health choices. I know I can walk out into my own backyard and find the plant(s) I need to use. You can get there too! And maybe you already are? I know that for me, it’s been an exciting journey and process. I’m not stopping my learning any time soon, for sure! Knowing how to use the wild, grown or dried plants is the next step after knowing which herbs to start with. You can know what to use….but if you don’t know HOW to use it, then what’s the use? Right? An herbal preparation is simply the way the herb is used and administered. There are internal applications as well as external applications. I thought I’d go ahead and organize them for you in a way that makes sense to me. Each section has a little overview, and then a brief description of each kind of preparation. FTC Disclosure: There are affiliate links scattered throughout this article. If you happen to click through and make any kind of purchase, I may earn a small commission at no extra cost to you. There are many kinds of preparations. Some are so simple, while others take some time and skill to create. Either way, knowing a bit about the different ways to use herbs will help you to start someplace. Here is a general list of basic herbal preparations and a little bit about each of them. I think it’s good to have an herbal use overview before I dig into each of them more deeply in future articles. Some preparations you can drink, take in drops, or even chew. There are even herbal preparations that are similar to candy, which makes them a great option for children or those hesitant to use herbs. Here is a cup of herbal tea. I love these tea infuser cups because they make the process perfectly easy for just one cup of tea. Water infusions are basically forms of teas. The water is the solvent that extracts the herbal compounds out so you can drink up! If you want the complete directions and explanation for water infusions right now, take a look at How to Make an Herbal Infusion: Loose Leaf Herbal Tea for the Beginner. These are your typical teas that are steeped for around 15-30 minutes. Often, these teas are made for pleasure as well as health and taste is a factor. You can buy these in the boxes in those stale old tea bags, but I feel very strongly that loose leaf teas will give you a much higher quality product. And, if you can make your own, a double win! You’ll know what in the tea, and you’ll avoid the chemicals in the tea bags and any possible chemical flavorings (sometimes called “natural”). And there are a TON more tea recipes on the blog. Infusions are basically very strong teas. Often they are steeped several hours or over night for the strongest possible medicinal tea. I make my infusions in larger amounts and tend to drink them over a couple of days. Although infusions may taste good, the taste is often not the reason you make an infusion. Infusions are more for nutritive and health purposes. Some plant parts, such as roots, barks, berries, and seeds don’t lend themselves well to infusing because they take longer or require more heat to break down and release the healthy constituents. A decoction is when you simmer your harder herbs for around 20 - 30 minutes in order to extract the most benefit from them. NOTE: You can find out a lot more about water infusions and how to make the perfect teas and strong infusions, and decoctions in this article. You can also check out this eBook, which provides directions and recipes for making your own tea blends and how to use them. These are tinctures in amber glass bottles and also the excess stored in a Mason jar. I carry this tincture in my purse at all times, and it is one Mr. V. and I rely upon often. Many herbal preparations involve some form of infusing (soaking) for a period of time in order to release the valuable plant chemicals. Every solvent (the liquid used to soak the herb) will have its own positives and negatives. Knowing which one to use depends on the person, lifestyle, and the expectation for what you need the herb to do. Vinegar is a great solvent for extracting herbal chemicals for use in the body. You can even use these infused vinegars to create culinary dressings, dips, or add to your cooking. Infused vinegars taste terrible, though, and are not the best way to take an herb straight. A very common and famous example of an infused vinegar is the traditional herbal elixir, Fire Cider. There are many versions of this recipe from herbalists over the centuries, and here is my recipe for this healthy infused vinegar tonic. Often, infused vinegars can be used as liniments, too (see below). Glycerites are sweet tinctures made with vegetable glycerin. These are not even close to being as strong as an alcohol tincture, but they are wonderful for people who can’t or don’t want to use alcohol. My all time favorite preparation: herbal tinctures. These are infusions of herbs in a base of 80 proof or higher alcohol. Alcohol is the strongest solvent you can use when it comes to making sure you obtain as many of the plant constituents possible. They can be pretty concentrated, too. An example of a tincture preparation is How to Make an Herbal Tincture. Herbal syrups can be quite powerful! Here’s my favorite cough syrup! Herbal syrups are usually cooked first in water, then the liquid is strained off and a sweetener is added. These are generally thinner and can be used all kinds of ways: to make jellies, served over other foods, or as additions to dressings. You can see a recipe for Forsythia Syrup here, as an example. If you’d like to make an elderberry syrup, this is my favorite recipe! I love adding honey to my toast in the morning. But what makes it even better is when that honey is infused with a nutritive or medicinal herb! Honey infused with thyme and/or garlic is one of my favorites! If you want to experiment with a great infused honey, take a look at this lemon infused honey recipe. Oxymels are herbal preparations using vinegar and honey as the solvent. The vinegar extracts a good deal of the plant constituents you want, while the honey provides extra health support and adds sweetness so it tastes better. You can find out how to make an elderberry oxymel in this recipe. This oxymel will boost your immune system and help you get better much faster from a bad cold or flu. Electuaries are basically powered herbs mixed into honey to create a thick paste. You can powder the herbs you need yourself if you don’t buy them this way. Here is an example of how to powder an herb and how to use it in these Nettle Powder instructions. You can make a runny paste that is easy to mix into a drink or even take by the teaspoon. You can also make a thick paste that can be rolled into balls or even little round pills. Electuaries are more concentrated than an infused honey and are a great way to get your family to enjoy using herbs! The supplies you need to get started using herbs for your health are quite minimal! You can make your own herbal capsules with the herbal powder of your choice and small capsules you can purchase. Here is a link to a capsule making machine so you can see what this looks like. You can add herbal powders easily to smoothies and other foods. In fact, I love to add Nettle powder to just about everything because it’s tasteless and is a great way to add nutrition and health benefits to food. Powders can also be used in making tea blends, although I prefer loose leaf teas. And, of course, powders are necessary for making electuaries. Using herbs in the tub is a wonderful way to obtain benefits. You can choose herbs to help you relax, to cool a fever, or to decongest your sinuses. The skin is our largest organ, and a warm bath will open the pores and allow any herbal constituents to enter our body through the skin. Essentially, bathing using herbs is like bathing in a nice herbal tea. A compress is when you apply hot or cold herbal tea on the skin for a variety of purposes. You can use herbs to create a liquid that will help with acute inflammation, like a bump on the head; to increase circulation to an area as needed; and many other issues. You also have the choice about whether to use hot or cold liquid. A fomentation is similar to a compress, except that you are alternating hot and cold in order to control or change the blood flow to the area according to Rosemary Gladstar in her book, Medicinal Herbs: A Beginner’s Guide. This helps move fluids in the body. Other herbalists work under the opinion that a fomentation should be kept moist and hot, rather like a damp hot pack. Fomentations would be great for aiding cramping, sore muscles as an example. An herbal poultice is any combination of moistened or crushed herbs, clays, etc. that is applied to the skin. Poultices can be as simple as chewing up some plantain leaves to soothe a bee sting or as complicated as a complete herb and clay mixture laid on the skin under a bandage. Poultices are wonderful for helping draw toxins out of the body or to soothe swelling and inflamed areas. Herbal oils make for a wonderful massage for sore muscles and aching joints. A liniment is a liquid that has been infused with certain herbs in order to bring relief to an area of the body. An example would be a massage oil used for sore muscles. A liniment can be made using herb infused vinegar, alcohol (as in a tincture), witch hazel, or an emollient oil. These are simply thick liniments made with an oil base and usually beeswax. You can find out everything you want to know about creating herb infused salves, ointments, and balms along with lots of recipes in this eBook. As you can see there are MANY different ways to use herbs. In our society, most people are comfortable with teas and vinegars. Luckily the interest in using natural methods of healing and helping our bodies is gaining. I believe using these methods will one day become more mainstream again, as they were in traditional times. Herbs are not only effective and useful, they are just lovely. I thought I’d add this section about the tools an herbalist needs in this Part 3 of How to Start Using Herbs series of articles. This is because you really don’t need that many tools. People trying to sell you something will often have these huge long lists, but in reality, you don’t need much to begin. You’ll need glass jars for infusing oils and tinctures (and even teas, as I use them this way as well). Glass jars are also the best way to plan to store your herbs. See Part 1 of the series for more information on drying and storing herbs. My favorite all around glass jars to use are half-gallon and quart size Mason jars. These are easy to find, have great lids, and you can also purchase plastic lids for Mason jars when dealing with vinegars. If you like, you can get fancy with your apothecary jars. These are a fun way to store your herbs, but are certainly not necessary. You’ll need a large bowl for blending teas, depending on how much herb you are working with. I use a large pottery bowl that is deep that was given to me by a friend years ago. It’s perfect. You don’t need anything fancy, though. A good glass mixing bowl will serve you fine. I couldn’t live without funnels of different sizes. I use tiny ones for essential oils, and a huge one for pouring larger amounts of liquid. Please use stainless steel, as you don’t want certain solvents like vinegar, leaching chemicals into your preparations. I also use these wide bottom funnels for pouring loose herbs into jars. It’s amazing how messy they can be, and this kind of funnel (generally used for canning) is perfect. Like funnels, you’ll need strainers of different sizes too, and perhaps a colander. You’ll need these to hep you strain the herbal liquid from the actual plant matter (also called the marc). You’ll need a good sharp knife, some wooden spatulas and/or spoons for cutting and turning and mashing. Every herbalist needs at least one mortar and pestle. These help you crush your harder herbs in order to release more of the plant chemicals. You can even powder your herbs with a mortar and pestle. A spice grinder is a wonderful way to powder your herbs finely if you need to (as when you make electuaries). I have two: one for coffee beans and one dedicated only for spices. You don’t want coffee flavor to end up in your herbs. I use these for my tinctures, glycerites, and infused vinegars that are medicinal. You can get them in small sizes (as small as 1 ounce) to larger sizes of up to 8 ounces. My favorite sizes are 4 ounce and 2 ounce sizes, as these tend to hold the perfect medicinal amount for keeping in your cupboard. You can actually re-use small jars or even use Mason jelly jars for salves and balms. Glass is my favorite kind of jar. I love these amber straight-sided jars best for storing salves and balms. Tins are another option, but try not to use aluminum due to the toxins. Buy stainless steel tins if you can. Honestly, you probably have most of what you need to start working with herbs in your kitchen or house right now. The nice thing about beginning to use plants for health is the cost is actually quite low, especially if you grow or forage your own medicinals. The tools are minimal, although you can sure get crazy with things, just like anything else. Some people go all out and buy things like stills, tincture presses, and so many other options. You’ll learn about these as you get started, but for now, the above list is a great place to begin. After finding out about which herbs to start using first, how to store them in part 1 of this series; and in part 2 using herbs safely and dosing amounts, you now have a great foundation to get started after reading this section—part 3! As we delve more deeply into the kinds of herbal preparations, along with some great basic recipes for each one, you will start creating your own herbal concoctions! You’ll discover how effective and fun learning to use plants for your health can be! Please leave comments, thoughts, questions, etc. in the comments section. I always reply! That’s all for part 3 of this series! Stay tuned for Part 4, where I will discuss Herbal Water Infusions for Internal Use in more depth, along with some easy recipes for you. P.S. If you haven’t done this yet, go ahead and sign up for the weekly newsletter! You’ll never miss a thing and you’ll also get access to the free password protected Resource Library that contains eBooks, checklists, guides, and lots more, such as this eBook on How to Use Herbs & Essential Oils to Relax with lots of recipes. Disclaimer: I am not a medical doctor, and in no manner, stated or implied, is any opinion I provide in this article meant to treat, cure, diagnose, or prevent any disease. Please seek advice from your medical doctor before using herbs and essential oils. These statements have not been evaluated by the FDA.